Habitat: Desert, Upland, Mountain. 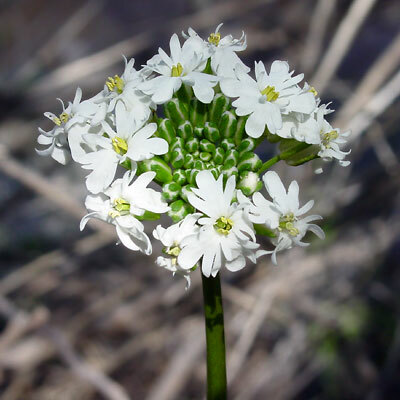 These cool weather wildflowers grow in moist, rocky canyons and on rocky hillsides in partly shaded locations under trees or next to large rocks. Description: The flowers are in terminal clusters. The individual flowers have 4, fringed petals, each with 4 to 9 lobes, giving them a fringed appearance. The flowers are followed by slender, elongated, upright seedpods. 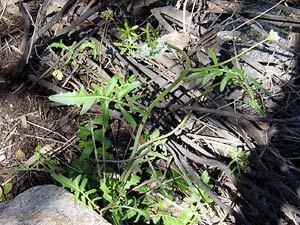 The leaves are green and deeply pinnately lobed or pinnately divided. The stems are green and leafy.